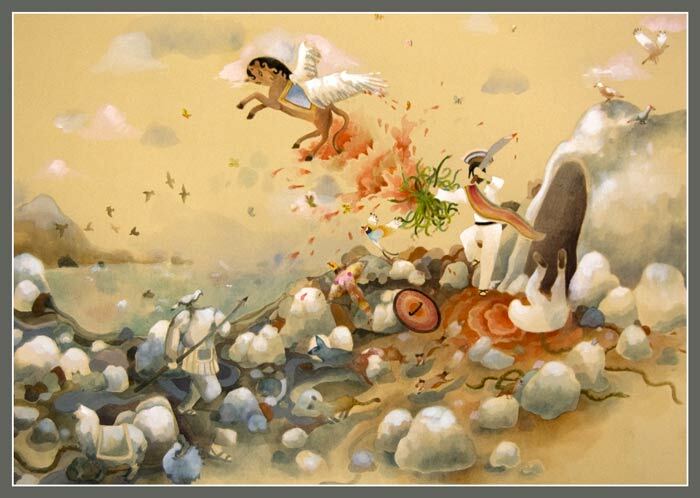 Anyway, I loved the whimsical animals in Kathy's earlier paintings, and suggested she paint a few animals that had been turned to stone returning to life (as some versions of the myth mercifully allow). I had no idea it would turn out this magical. Kathy (without prompting) painted some of our favorite "Detroit wildlife": pheasants, foxes, rabbits, stray cats. And a llama. It was great to have the artist in the room when I brought my daughter over to see it: the kid literally drew in a quick breath and her eyes grew huge. There was no critical pretension or politeness of friendship to muck up the moment. It was pure awe. She loves it. And so do I.
Kathy was worried there was too much blood. I was like, "Are you kidding? Have you heard this kid tell a story?"